Yesterday dawned bright and clear, with temperatures soaring into the low 60's. After this interminably long winter, with well below average temperatures and above average snowfall, it was quite nice to finally see the first botanical sparks of spring popping to life. So it was a treat to connect with John Howard, Susan Nash, and Daniel Boone and go exploring some of Adams County's best habitats, such as this prairie opening. Daniel Boone poses by a White Cedar, Thuja occidentalis, that is probably far older than its size would suggest. Growth comes slow in a rocky opening such as this, and the tree is probably in excess of a century in age. Hard to see in the photo, but Dan's left hand touches a small Dwarf Hackberry, Celtis tenuifolia - just one of many rare plants that occur in habitats such as this. Until this trip, I had seen only a handful of "wildflowers" in bloom in my tundra-like neck of the woods, and nearly all of those were weedy nonnatives. That changed with this foray. This shrub or treelet, the American Hazelnut, Corylus americana, flowers well in advance of leafout, and its pendant spikelets of male flowers are quite conspicuous and reveal the plants allegiance to the birch family. Far less noticable are the pistillate, or female, flowers. Look at the branch's tip in the photo's upper righthand corner - there it is, the tiny scarlet flower. One of the woodlands that we explored had large rafts of this small parsley family member, the Harbinger-of-spring, Erigenia bulbosa. It is sometimes known by the equally apt name of Salt-and-pepper. We stopped by a robust station of Snow Trillium, Trillium nivale - probably the largest population in Ohio. Most plants have up and down years, and this is a boom year for this stand of trillium. They were not yet peak, yet we saw many thousands of plants. One of spring's faithful harbingers are the hepatica, and we saw scores of Sharp-lobed Hepatica, Hepatica acutiloba. I began to notice incredibly small beetles on hepatica several year ago, and now that my eye is attuned I see them on as many or more plants than not. This beetle belongs to the subfamily Nitidulinae of sap-feeding beetles (thanks Anthony Rodgers! ), but we don't know the species. These beetles busily clamber about the anthers, plundering pollen, and must play a vital role in the life cycle of hepaticas. A must-see spring spectacle in this neck of the woods is the mass blooming of Goldenstar, Erythronium rostratum, one of our rarest lilies. I was not optimistic that the plants would be above ground, given the lateness of the spring, but good ole Dan Boone was correct in his confidence and I'm glad that we stopped by. Goldenstar resembles the common, widespread Yellow Trout Lily, E. americanum, but its petals are held in a flat plane rather than being strongly recurved, and the tepals (they are not technically petals) have an orangish cast. This rarity has a scattered and local distribution, with the Ohio station at its northern limits. 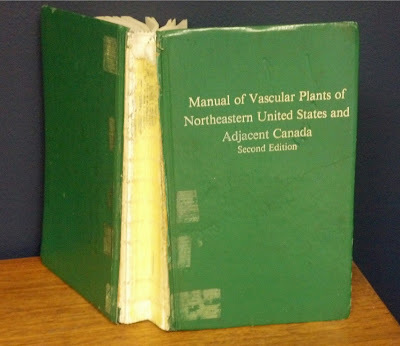 Interestingly, I believe that this is the only native plant that was accidentally omitted from th Manual of Vascular Plants of Northeastern United States and Adjacent Canada, that I discussed in this RECENT POST. After a while, we ventured into open sandy habitats along the Ohio River in search of other plants. Lots of weedy nonnative chickweeds and mustards where tinting the otherwise barren fields, and sprinkled among them were these native American Field Pansies, Viola bicolor. Note the conspicuous purple nectar guides leading into the glowing yellow center of the flower - these colorful ornamentations are there to draw pollinating insects to the core of the flower. Finally, we concluded with a stop to an interesting Ohio River sand terrace to seek one of our primary targets, the Little Whitlow-grass, Draba brachycarpa. To call this elfin mustard diminutive would be an understatement. The plant just to the left of the dime is in peak bloom; the smaller plant just to the left of that has already flowered and is setting fruit. These particular plants are not runts, but are about average in size. Little Whitlow-grass (not a grass of course; I'm unsure of the origins of this curious common name but suspect it originates from some Old World group of plants) is so small that you can't really spot them while standing upright. A closeup of an inflorescence in the act of opening, with tightly closed purplish-red buds in the center. You could probably easily pile 100 of those miniature flowers on the dime in the previous photo. In spite of their tiny size, the flowers are frequently visited by a variety of little bees, flies and other early to emerge pollinators. This Little Whitlow-grass has already set fruit. The oval pods are known as siliques (sil-eeks), which is specialized mustard terminology. They'll ripen in short order, and pepper the ground below with scores of dustlike seeds. If the conditions where the seed fell are suitable next year, up will pop more whitlow-grass, thus perpetuating the life cycle of this critically endangered (in Ohio) annual plant. 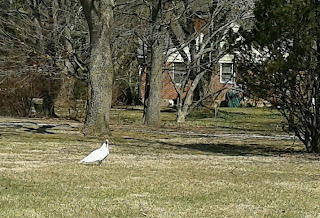 A snow white Turkey Vulture! Imagine peering up into the clear blue ether, and seeing this giant white bird wafting over. You'd do a double take, and a birder would slam on the brakes and hop out for a better look. That's what Kathi Groves did yesterday as she cruised up Frederick Pike in Montgomery County, just north of Interstate 70 near Dayton. Fortunately, she had a camera handy and the presence of mind to snap a few photos. Bev & Ed Neubauer suggested that she send them along to me, and I'm glad that Kathi did because now I can share them with you. The Turkey Vultures are in full migration mode right now, and it's commonplace to see them drifting high overhead. But most of these dark undertakers of the bird world don't look anything like this! 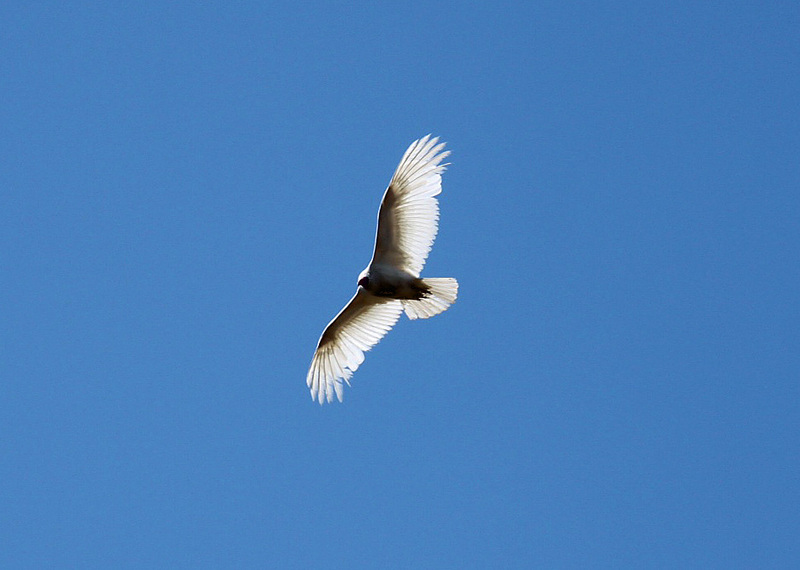 Kathi's vulture is leucistic, and highly so. This genetic anomaly causes melanins, or dark pigments, to be washed out and pale. Most typically leucism manifests itself in a "piebald" pattern - patchy blotches of white, or perhaps just one prominent white bodypart such as the white-headed American Robin that someone just sent me a photo of. Leucism is a numbers game - the more animals in a population, the more likely that an individual will carry this recessive trait. That's why the most commonly reported leucistic birds tend to be abundant species such as American Robins, Red-tailed Hawks, and Turkey Vultures. Kathi's vulture may be the whitest one that I've seen, but it isn't the only one. 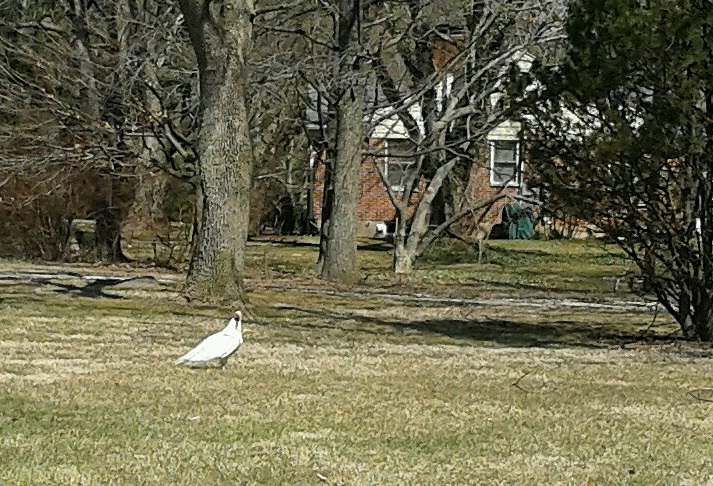 For years, a leucistic Turkey Vulture frequented the vicinity of Egypt Valley Wildlife Area in Belmont County, and became a local celebrity. 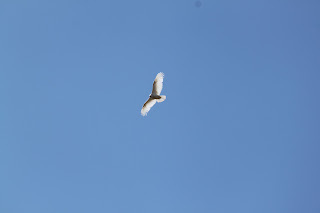 It's patchy white wings made it stand out from afar, and I saw it on a few occasions. Then there's THIS BIRD, from a few years ago. As Kathi watched, the vulture cruised earthward and alit in this yard. I can only imagine the surprise of the homeowners, if they happened to glance out the window and notice this thing. Thanks to Kathi for sharing her discovery and photos! If you're in the area of Frederick Pike and I-70 in north Dayton, keep an eye peeled for this vulture, and please let me know if you see it. The bird may just be passing through, but perhaps it here to stay. A whole lotta plugs for various events on this here blog of late, I know. But late winter and early spring have become conference season in Ohio, it seems, and many of these events are well worth a pitch. The Ohio Botanical Symposium is one of them. This will be the 13th year for the symposium, and it's grown like a weed. Your narrator pitched the idea for the symposium back in 1999, when I worked as a botanist for the ODNR's Division of Natural Areas. We started small - about 35 people in a classroom at the Ohio State University. The last go-round saw about 450 people, and the symposium has long since moved to much plusher digs. So mark your calendar for Friday, April 5th, and check in HERE to register. The venue is the beautiful Villa Milano in Columbus. Following is a summary of the agenda, spiced with a few showy photos. It's a great slate of speakers and topics, any one of which is worth the price of admission. Rob Naczi will be in the house and delivering the keynote. Rob's in the Big Apple now, working as the curator of North American Botany at the New York Botanical Garden. He'll be talking about his work to revise one of America's most iconic botanical works, the book above. The tattered book in the photo is my original copy, and it was probably one of the first that was sent out. "The Manual" appeared in 1991, and mine has seen a lot of use and abuse in the intervening two decades. A lot of advances in our knowledge of flora occur in 20 years, and it's time for an update. 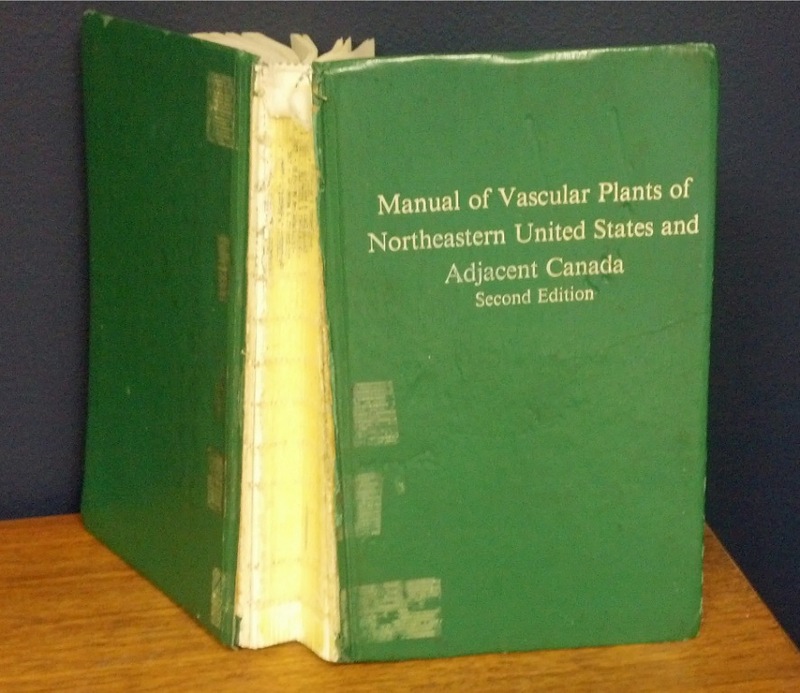 The brainpower behind the 1991 edition of The Manual was also a botanist housed at the New York Botanical Garden - Arthur Cronquist. Cronquist was a living legend for much of his botanical career, which encompassed most of his 73 year life. Tragically, he passed away in 1992, the year after his epic revision of The Manual was released. I have an interesting story about Cronquist's book. Upon receipt of our copies, I and my peers immediately devoured the pages, searching for new tidbits and marveling - and trying to comprehend - the new "Cronquist" system of taxonomy. I found a new tidbit indeed, on page 656 of The Manual. Under the account for the Erect Dayflower, Commelina erecta, Cronquist stated that it occurs in "Dry, usually sandy soil... [including] O. [Ohio]". Whoa! We knew of no Ohio records for this interesting plant, but its presence here would certainly be possible. 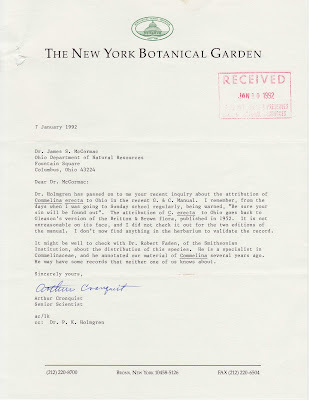 I figured that Cronquist, with his vast stores of knowledge and access to the NY Botanical Garden's expansive herbarium, was privy to something that we didn't know. 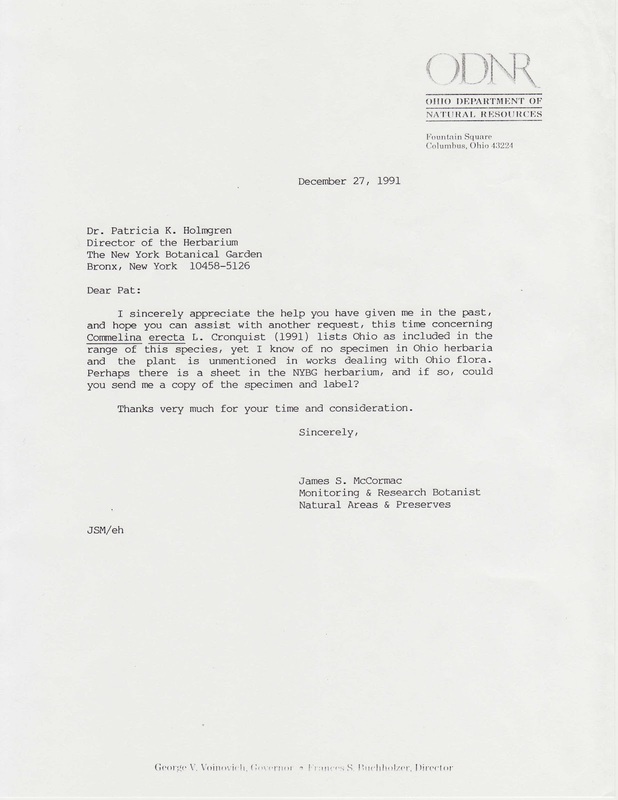 So I dashed off the letter above to Patricia Holmgren, director of the NYBG. If you click the letter, it'll expand for readability. A few weeks later, I was floored to receive the letter above. The Man himself had written! 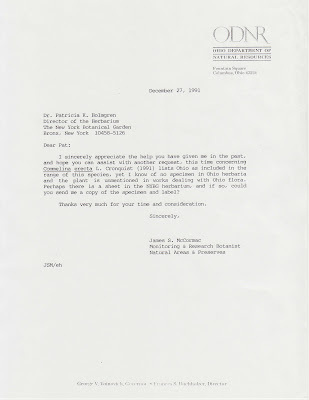 Cronquist actually took the time to respond to my query, in his humorous style. 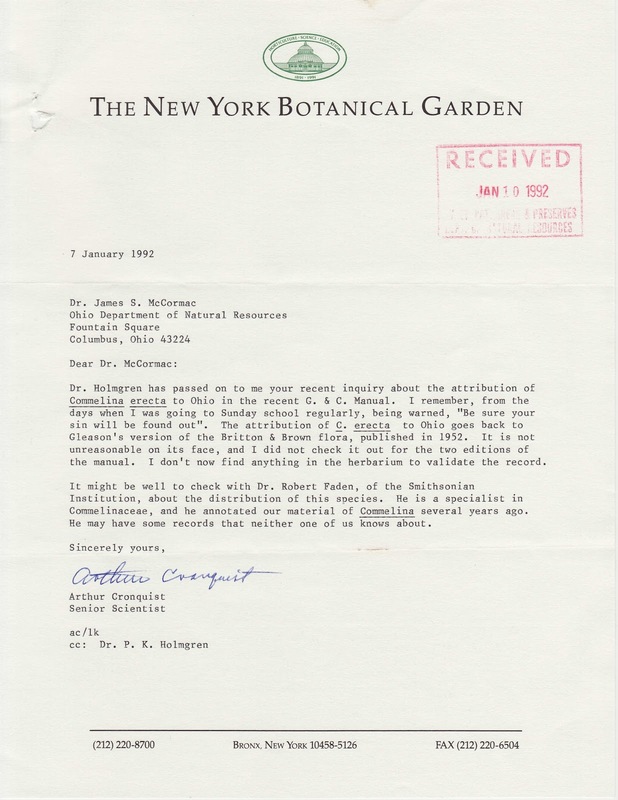 That such an esteemed scientist - he was probably the most highly regarded active botanist in the country at that time - would take the time to respond to some unknown person in the heartland of Ohio made an enormous impression on me. As it turned out, he died only two and a half months after this letter was written. Anyway, on with the talks. As has been done since the inaugural symposium, there will be a talk about the best plant finds of recent seasons, ably delivered by Tim Walters. The spindly little sedge above - a plant that perhaps only a botanist could love - was a star of one of the last Best Finds talks. It is Rocky Mountain Bulrush, Schoenoplectus saximontanus, which was rediscovered by Dan Boone in Pickaway County in 2008. The last Ohio sighting prior to Dan's discovery was in the 1940's. Judy Semroc, who is one of the region's best all around naturalists and photographers, will deliver a program on insect pollinators and their often specialized relationships with plants. Be prepared for plenty of stunning imagery. One of the most entertaining and energetic botanical lecturers, anywhere, is David Brandenburg. He'll be talking about Ohio's asters, and that covers a lot of beautiful ground. Pictured is one of our most stunning species, the Smooth Aster, Symphyotrichum laeve. Ginseng, Panax quinquefolius, is tops in value of the medicinal plants in our flora. Prices can hit $500 a pound for dried roots, and as a consequence the plant is becoming scarcer. Eric Burkhart of Penn State will explore the history of the ginseng industry. 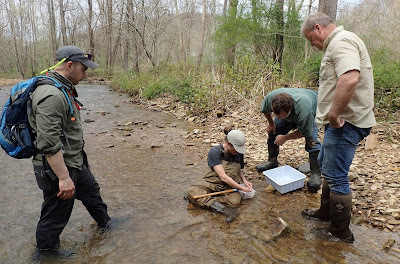 Chris Bedel of the Cincinnati Museum will give a program on the 16,000 acre Edge of Appalachia Preserve in Adams County, one of Ohio's great bastions of biodiversity. Chris is a fabulously entertaining speaker, and full of knowledge about the area that he has managed and lived in for years. Finally, John Mack will talk about a place that ranks high among the rarest of the rare, Daughmer Savanna in Crawford County. Nearly all of our prairie savannas have been destroyed, thus it was a major coup when Daughmer was purchased and protected as a state nature preserve a few years ago. You won't want to miss the Ohio Botanical Symposium, so register soon, RIGHT HERE. The issue of feral cats - house cats gone wild - has simmered for years. Occasional events trigger seismic eruptions in the "debate" between the pro-cat and anti-cat camps. In fairness, it should be noted that many of the so-called "anti-catters" are certainly not anti-cat. Many are like myself - I own three cats, all of which needed homes, and I have been smitten with felines since I was a tot. And mine DO NOT go outdoors. But I, like scores of others who might be labeled "anti-cat", recognize the massive problems caused by ferals. Conversely, many of the pro-catters also see the need to reduce the populations of cats gone wild, recognizing the damage that they do to native populations of birds and other animals. Many of us would like to see humane and sensible solutions adopted to reduce the millions of feral cats in this country. The latest major flare-up in the cat wars occurred recently, when longtime writer and conservationist Ted Williams penned an anti feral cat op ed for the Orlando Sentinel. The National Audubon Society, which had run Williams' column "Incite" for 33 years, promptly parted ways with Williams when the cat poo hit the fan over the Sentinel piece. Audubon's parting of ways with Ted Williams incited all manner of blog posts and other writings about that particular issue, and the larger issue of feral cats. If you want a fascinating insight into the emotions generated by the feral cat issue, read THIS entry that was made on the blog 10,000 Birds. The blog article will point you to Williams' controversial Sentinel article, which provides an overview of the feral cat issue. But what is really fascinating is the comments - about 124 of them! - on the blog. Predictably, the pro and anti feral cat camps go at it, but even people who should be on the same page are at each others throats. Read the blog, and its attendant comments, HERE. Back on March 8, I found myself at Tom Ruggles' place in Zanesville, attempting to observe and photograph Jeffrey, his spectacular yellow Northern Cardinal. You can see photos and read about this amazing bird HERE. As is often the case while watching feeders, we were routinely distracted by marauding squirrels. On this day, however, we found ourselves rather charmed by their antics, and I was thoroughly smitten by certain of these bushy-tailed rodents. We noticed this pair of Gray Squirrels, Sciurus carolinensis, way out in the back part of the lot. I'm assuming this is an amorous pair filled with the seasonal lust of spring. They remained 20 feet up this tree, nearly nose to nose, for quite some time. A lesser male, presumably, watches wistfully from the tree to the left. After a bit, the two squirrels sidled up side by side, possibly communicating telepathically (for all I know). They also remained like this for some time. Assuming the male was charming enough, the end result will be little squirrellets later this spring, the first of two batches. Gray Squirrels often have another breeding period in mid-summer. Elfin squirrellets become big squirrels eventually, and turn their sights to the local bird feeders if any are at hand. Their fondness for seed leads to one of the greatest man vs. wildlife interactions in the lower 48 states. Frustrated feeders of birds wage all out war on the clever beasts, devising numerous ploys to prevent the furry spidermen from accessing the feeders. Normally, the squirrels win. This one is practically thumbing his nose at us, and we were but a few feet away peering through the windows. Tom's squirrel dog, which is essentially a miniature Golden Retriever, was right by our side and quaking and simmering with rage at the insolent interloper. However, I insisted that the dog put a cork in it so I could make photographs of the squirrels, which probably did not endear me to said canine. This is the animal that I really wanted to see and make photos of - the "black" squirrel. There is a healthy population of these sooty-colored squirrels in Zanesville, and they intrigue me. Perhaps it is because I hail from a land which has no black squirrels. There are supposed to be colonies of them in and around Columbus, Ohio, where I live, but I never see them here. Only the grays. So the spectacle of one of these black squirrels is a treat for me, a bit like seeing an alien descend from Spaceship Oak. Even though the so-called black squirrels look totally different than their gray brethren, they are pretty much one and the same. The blacks are melanistic Gray Squirrels - they have one or two special genes that rewires their genetics to produce an abundance of melanins, or dark pigments. While most are coal-black such as the fellow in the photo, sometimes individuals with blond, gray, or even white highlights can be found. The city of Kent, Ohio is especially famous for its abundance of black squirrels. Supposedly, the original stock of 10 squirrels was imported in 1961 from Canada and they've since spread like wildfire. But melanistic Gray Squirrels occur naturally and most populations have probably long been present and were not assisted by people. The black squirrels are most prevalent in Ontario, Canada and the northeastern United States. One theory has it that the black form of the Gray Squirrel dominated prior to European settlement, when forests were still primeval and their dark coats helped the squirrels better blend with the shady old-growth woodlands. As the forests were opened up and hunting of squirrels increased, gray forms were favored as they blended better with the changing habitats. Mothapalooza is a field trip-based celebration of moths the likes of which the world has never seen! Well, I don't really know if that's a fact, but it is going to be an awesome extravaganza, of that I can assure you. We entered into the hatching and planning of this event with a slight bit of trepidation, not absolutely knowing if there would be enough moth enthusiasts to draw much of a crowd. Our fears have already been largely allayed. Even though Mothapalooza doesn't take place until the distant weekend of June 14-16, 70 people have already signed on. We can only accommodate about 120 folks, so register soon. Obviously, moths will be a huge part of the aptly named Mothapalooza, but there's more, much more. The conference is based at the lodge in Shawnee State Park, which is surrounded by 60,000+ acres of state forest. A crow's caw to the west is the 15,000 acre Edge of Appalachia Preserve. We'll be exploring throughout this incredibly rich region, which is loaded with cool and rare plants, interesting breeding birds galore, and blizzards of moths. Bring extra cards for your camera. We are excited to have bugman extraordinaire Eric Eaton on board and leading trips. That's Eric, in green shirt and cap, facing away from the camera. Eric is the principal author of the Kaufman Field Guide to Insects of North America, which is the people's favorite when it comes to easy to use references for identifying insects. Eaton was in the midst of teaching a wasp workshop when I took this photo. The building in the backdrop will be one of our moth-trapping sites at the Edge of Appalachia Preserve. We'll get all kinds of cool stuff at this site. Doing its best to look like a bird dropping, albeit a rather cute bird dropping, is this Beautiful Wood-Nymph, Eudryas grata. It is but one of scores of interesting moth species that we'll see during Mothapalooza. Mr. Caterpillar himself, David Wagner, will be a major part of the scene. That's Dave, far right, in the midst of beating interesting caterpillars from the foliage of those stunning Marsh Rose Mallow plants. Dave is a whiz when it comes to moth ID, too. Rich McCarty and Pete Whan are to Dave's left. 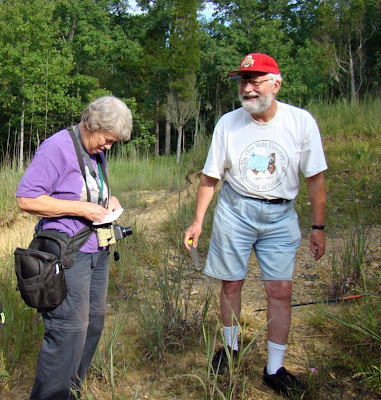 They work for the Ohio Chapter of The Nature Conservancy and manage the Edge of Appalachia Preserve, and both will be helping with Mothapalooza. To the rear and sporting a headband is John Howard, an extraordinary naturalist whose photos I've shared many times on this blog. Nothing will escape detection and naming by this crew. This is one of the numerous cool and interesting caterpillars that we should see: the Unexpected Cycnia, Cycnia inopinatus, a rarity in Ohio. They prefer to snack on Butterfly-weed, and match the flower color of that milkweed quite well. In addition to numerous common moths, we'll dredge up some rarities such as this Coppery Orbexilum Moth, Hystricophora loricana, a species of very limited distribution. We've even got the president of the Ohio Lepidopterists onboard with Mothapalooza, Dave Horn. This is Dave, standing in one of Adams County's prairie barrens. These sites are loaded with RARE THINGS, and we'll be checking them out. There are many other topflight experts working with Mothapalooza - too many to name in this blog without creating a small telephone book. Check the Mothapalooza website to see who's who. Most moths are utterly stunning, although often on a tiny scale. This is a common species and one that we ought to see, the Common Spragueia, Spragueia leo. One of the Mothapalooza workshops focuses on photography, and John Howard and I will be conducting that session. We'll try to share some tips and tricks for capturing moths great and small on pixels, in all kinds of conditions including the black of night. Thanks to the work of Cheryl Harner, who will also be helping, we've enticed lepidopterist Jaret Daniels up from Florida. 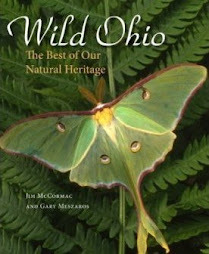 Jaret knows butterflies - he literally wrote the book, Butterflies of Ohio. We'll not only be out after dark moth-seeking. Daytime trips will venture into some of the richest butterfly habitats north of the Ohio River. Here's one of many specialty butterflies that we ought to turn up during Mothapalooza, the Juniper Hairstreak, Callophrys gryneus. This shot, and every photo in this post, was taken at the very sites that we'll be exploring during Mothapalooza. We are proud to be linked with the greatest effort to promote moths the world has ever seen, National Moth Week. Be sure and visit their site, HERE. Moths play an incredibly important role in earth's ecosystems, and education about the value of moths and their caterpillars is a huge part of NMW and Mothapalooza. 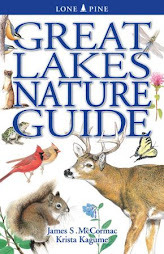 We are also indebted to our other sponsors: The Ohio Division of Wildlife, Flora-Quest, and Midwest Native Plant Society, as well the vital support of the Ohio Chapter of The Nature Conservancy and the Cincinnati Museum Center. If you're looking for an out-of-the-box experience that will be jampacked with interesting critters and plants in one of the most beautiful regions of Ohio, Mothapalooza is for you. See all of the details and registration info RIGHT HERE. A gorgeous vernal pool at Stratford Ecological Center in Delaware County, Ohio stands ready to receive its annual deposit of salamanders. But the salamanders have been slow to come. I was at this pool last night, hoping to see a barrage of amphibians trucking through the woods and into the pool's placid waters, but the invasion never materialized. As was the case the only other time I've been out salamandering this spring, the evening started off looking good: decently warm, and plenty wet. But come nightfall, temperatures rapidly plummeted and before long had dipped to the low 40's. That's a bit chilly even for hardy hypothermia-defying salamanders. I carefully slogged around the pool's margins, and saw no spermatophores (the male salamander's sperm packets), or egg masses. There were probably were some, but nothing like there should be had the salamanders arrived in full force. I think they'll get to the vernal pools eventually, but this spring's crazy cool weather with barely a warm rainy night has delayed the migration of the salamanders. If you are not acquainted with the spring migration of mole salamanders, which is one of Nature's fantastic spectacles, CLICK HERE. That's not to say we didn't see any. Several stunning Spotted Salamanders, Ambystoma maculatum, made an appearance. When photographers sight a salamander, they'll typically pose the animal on some bright green moss, or a downed log. There's probably no harm in that, as long as one is gentle with the animal and the handler takes care to keep his/her hands wet. But in the case of the above photo, no posing was necessary. I was surprised and elated to shine my flashlight's beam up the path, and see this male Spotted Salamander perched beautifully atop this branch. I was able to make a series of images without ever touching the animal. We also found a few of the much duller Smallmouth Salamanders, Ambystoma texanum. This species may be the most resilient of our mole salamanders, occupying a wider range of wetland habitats than their fellow mole salamander species. This is the Spotted Salamander that posed on the log a few photos back, now on the forest floor and navigating unerringly to the vernal pool. And here we have what must be a gravid (pregnant) female. Look at the size of that belly! Presumably she is full of eggs, and once in the pond's waters she'll uptake the spermatophore of a male and thus fertilize them. The eggs, upon contact with water, expand greatly and become conspicuous gelatinous masses. I am of the (hopeful) opinion that most of the mole salamanders have yet to make the march to the breeding pools, at least here in central Ohio. There does not appear to be a warm rainy night on the horizon for a week or so, but when such a night arrives I suspect many more salamanders will be out and migrating. If at all possible, I'll be out in the night, camera in hand, to document these amazing creatures. Ruffed Grouse, strutting his stuff! The following photos and video come courtesy of John Howard. 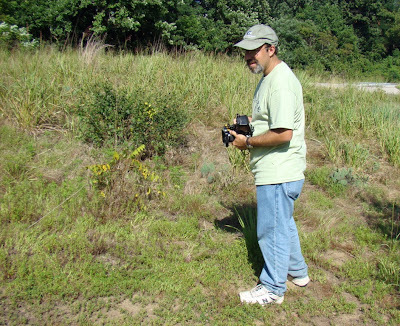 John lives in southern Ohio's Adams County, and is a naturalist's naturalist. Many of the interesting finds and stories that I have shared on this blog from that part of the world, and there have been many, have been in the company of John. He's shown me many a new plant and animal over the years. Anyway, the other day John was out and about in the backwoods of Adams County when he happened onto a Ruffed Grouse, Bonasa umbellus. 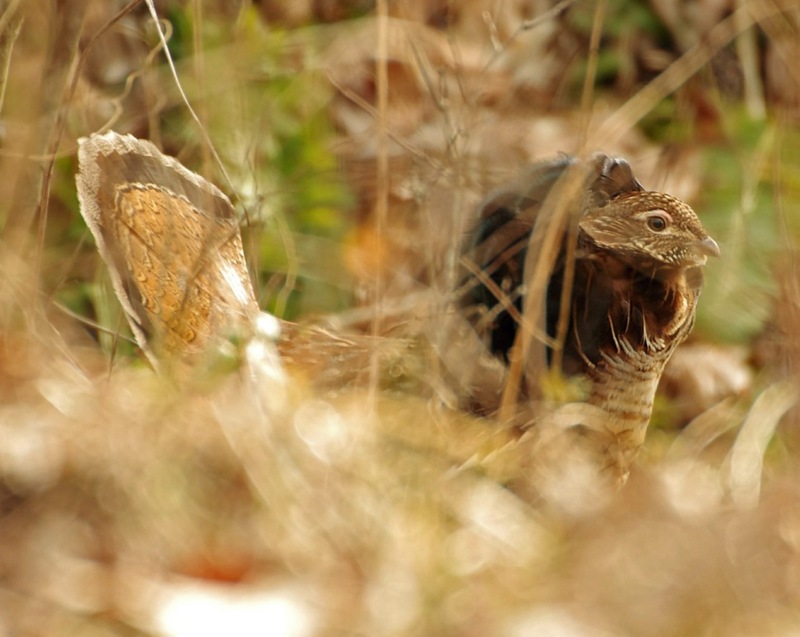 Grouse have declined markedly in much of Ohio, but in some areas of Adams County and neighboring Scioto County, they can still be locally common. Starting about now, one often hears the deep hollow drumming made by displaying males rapidly beating their wings. This sound starts slowly and accelerates, and always reminds me of a lawn mower being fired up. However, male grouse do much more than drum when the testosterone gets flowing, as we shall see. A Ruffed Grouse in the brush or woods can be a devilishly hard bird to spot. I've seen hundreds of them over the years, but most were blurs that exploded under my feet and rocketed off through the forest. We can tell that this bird is a male, so we may be in for some action as it is the amorous season for grouse. The thick blackish terminal tail band on a female is somewhat broken and incomplete at the apex of the tail. Ah! Out struts the grouse, to put on a display that is guaranteed to wow the grousettes! You can see how this species was dubbed the "ruffed" grouse - check out those manelike feather boas surrounding the bird's neck. 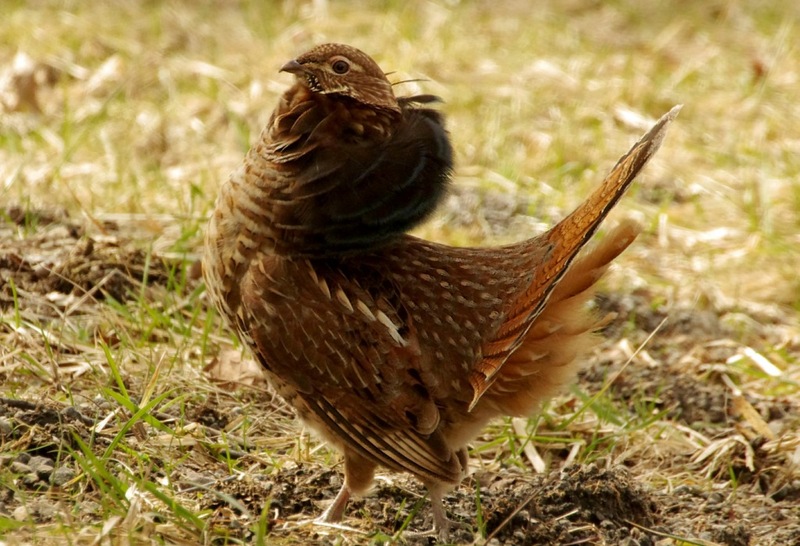 When male grouse strut their stuff, they puff these ruffs up to incredible dimensions, flare the tail to its full glory, and stalk about in the manner of a displaying tom turkey. On more than one occasion, John and I have lamented the fact that our cameras have excellent video capability - but we forgot to use them! It's easy to get caught up in the moment and focus on making photos when a rare opportunity happens along. Well, that didn't happen this time. After making some really nice images, John triggered the video feature and captured the ultra-cool clip above. Given the relative scarcity of Ruffed Grouse in Ohio these days, there are many Buckeye State birders who have yet to see one. And one can be in the field a lot, over a long period of time, and never witness the strutting courtship display of a love-struck grouse. I never have, and appreciate the chance to witness this neat aspect of grouse behavior via John's video. Be there or be square! 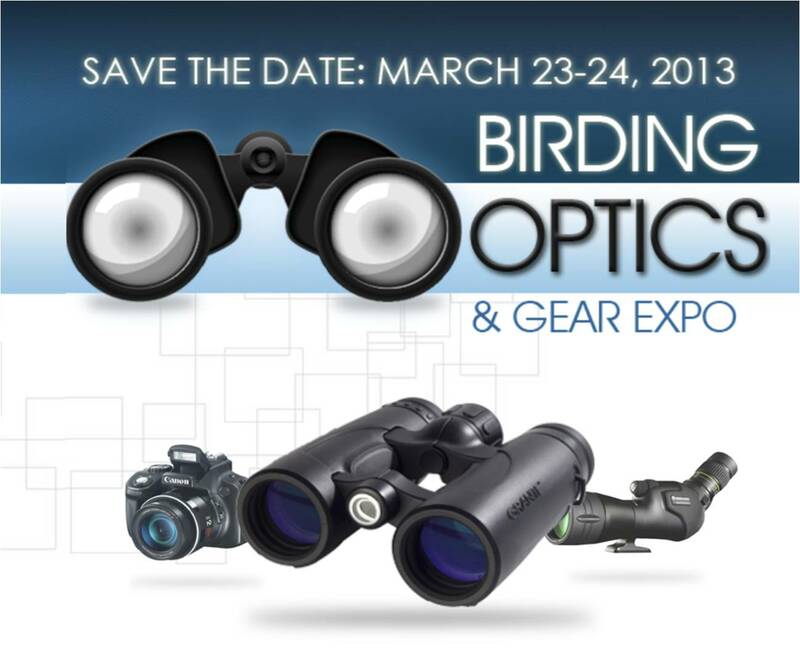 The first ever Birding Optics & Gear Expo takes place Saturday and Sunday, March 23 and 24 right smack in the middle of Ohio, in Columbus. The experts at Bird Watcher's Digest are behind this, so you know it'll be good. These are the people who orchestrate America's best birding event, the Midwest Birding Symposium, after all! All of the big optics companies will be on hand: Leica, Zeiss, Swarovski, Vortex, Celestron, and more. I am especially pleased that Midwest Photo Exchange will be in the house. They've got the coolest camera shop around, and that's where I get all of my photographic gear. They are a treasure trove of everything photographic, and the employees know everything there is to know, it seems, about photography. 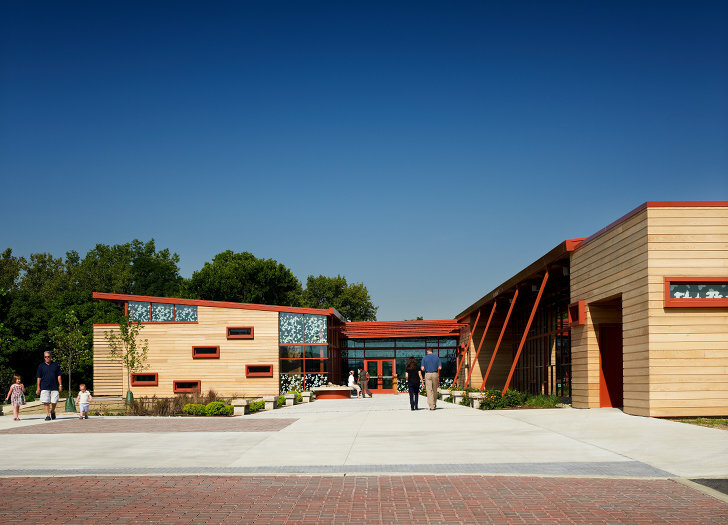 The venue is the sleek and slick Grange Insurance Audubon Center, just south of downtown Columbus. It's worth the trip just to see this place! "Test driving" optics before buying is important, and you'll have plenty to point them at right outside the building. Being that it's mid-March, things won't look quite this green but this is the view outside the center's back doors. The local Peregrine Falcons make frequent sorties over the grounds, and the nearby Scioto River attracts plenty of other birds. CLICK HERE for an article that I wrote about this site, last fall. Admission is FREE! Just come on down between 9 am and 4 pm on Saturday, or between Noon and 4 pm on Sunday. The complete lowdown is RIGHT HERE. I've said it before, and I'll say it again - the Hughes are trail cam masters, and they're doing amazing things with their candid cameras. If you've checked this blog with any frequency, you've probably seen some of the fabulous cam work by Laura and David, which they've been kind enough to allow me to share. Some recent examples are HERE, and HERE. Laura just sent along their latest film-making endeavors, which feature a Mexican standoff between a tough Bobcat and two marauding Raccoons. It's pretty cool stuff, and she upped the ante by tossing in a neat video of a Gray Fox tumbling around in some fresh catnip. I'm always flabbergasted by the amazing critters that the Hughes manage to find via their cams. This isn't luck - they know animal signs, and place the cameras in the right places. And remote and sparsely populated Monroe County, where they make these vids, abounds with wildlife. Of course, a little bait doesn't hurt, either. I've got the feeling that they'll eventually record something truly stunning - even better than what we've got here. Puffed up and looking large and in charge, two Raccoons swagger into the deer carcass. Too bad someone even badder is already there. The Raccoons test the waters, as it were, and attempt to horn in on the deer carcass. Their bullying attempts do not dissuade the Bobcat, which bristles up and stands its ground. I suspect that, from a distance of two feet or so, that little cat's stare looks mighty intimidating. Were there audio accompanying these screen captures, I'm sure we'd be treated to some ear-splitting snarls and blood-curdling screams. Here, we can see the Bobcat caught in full-throated yowl, and apparently that's enough for the band-tailed would-be robbers. They turn tail and amble off, looking for easier carrion. Laura had two cams on this deer carcass - one shooting stills as seen above; the other video. Unfortunately, the video cam 's battery died before the cat/raccoon encounter, but before it conked it it did record this cool sequence of the Bobcat coming into the carrion. Here's the bonus Gray Fox cavorting in catnip video. Spicing the ground strategically with a little Nepeta cataria can work wonders, and this fox reveals its catlike attributes by rolling around in the stuff. Thanks as always to Laura and David for sharing their stuff! 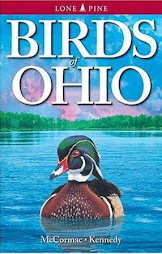 Adam Grimm: Ohio Wetlands Habitat Stamp winner!